For a few decades dash cams have assisted law enforcement as well as citizens in capturing and recording roadside events. These recordings have offered unique insights and helped uncover the truth of many events throughout recent years. Although dash cams might be recognised as a common car accessory today, their original use was mainly for law enforcement purposes. The earliest known dash cams were found in the United States Texas police vehicles in the 1980’s. These dash cams weren’t mounted on the dashboard of cars as seen today but rather held up by a tripod on the front or rear windows. Thus, the first dash cams were large and bulky pieces of equipment used by law enforcement in the US. Additionally, unlike modern dash cams, these early models made use of analogue technology meaning their recordings were not digitally saved to memory but rather recorded through VHS cassette tapes. This made the transfer and storage of their recordings much more time-consuming. Early dash cams did not become popular until much later in 2009 when the Russian government made them legal for citizens to install. This helped increase the interest of dash cams in the US and increase their popularity amongst the public. In the early 2000’s false insurance claims from people purposely throwing themselves in front of vehicles and forcing drivers to pay out large amounts of money was increasing. This increased the need for dash cams to help drivers protect themselves against false insurance claims like these. Videos showcasing footage of such acts began surfacing and helped to raise awareness of the unlawful activities. In 2013 it was reported that over one million Russian citizens were making use of dash cams to help protect drivers against false claims. 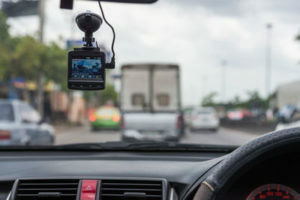 Additionally, the US and UK saw an exponential increase in dash cam sales due to the rising popularity of footage showing people purposefully committing these unlawful acts in a bid to lay false damage claims against car drivers. Police reality shows that made use of real dash cam footage also started becoming popular. These shows showcased real events from the perspective of law enforcement officers using shocking footage captured by the dash cams. This helped to raise further awareness of dash cams amongst the public. The most apparent difference between dash cams today and their earlier counterparts lie within their appearance and size. While the first dash cams were large and bulky the new models we see today are much smaller and less obtrusive. Some models are even built into the car, concealing them entirely. Dash cam models of today make use of digital technology meaning the footage captured by these devices can be saved and transferred more easily than that of the older analogue models. Footage can be saved on memory sticks and viewed much more easily than in the past. Some newer dash cams provide additional features such as location tracking using GPS technology allowing you to identify the exact location of moments captured by the camera. Additionally, using GPS technology users can call for help and their location can be sent to emergency services through the dash cam GPS features. Due to advancements in computer technology and digital storage, dash cams today can save much larger quantities of video footage than before allowing for more extended periods of use. Additionally, newer dash cam models offer superior audio and high-definition video quality improving visual clarity. Many transportation services today make use of dash cams due to their ease of installation and ability to protect drivers against unlawful activities. As a result, many taxi and Uber drivers make use of dash cam technology to assist in their day to day business operations. Truck drivers and other driving services also use dash cam technology to help protect drivers as well as their employers from any unforeseen circumstances. Some new car models today make use of built-in dash cam technology and have even combined them with sensors assisting drivers with parking. Additionally, smart cars can use built-in dash cam technology to help make critical adjustments to avoid car accidents. Insurance industries also benefit from the increase in popularity in dash cam technology as insurance claims can be more easily reviewed and their legitimacy can be more accurately proven. Some insurance companies even offer reduced premiums for drivers that install dash cameras in their insured vehicles. Dash cams have evolved from police gadgets to mainstream everyday use equipment by the public over the past few decades. Their ability to offer proof from unforeseen circumstances makes them ideal for those who wish to protect themselves against such events. If you are interested in purchasing one, then we would highly recommend you read our dash cam buying guide.